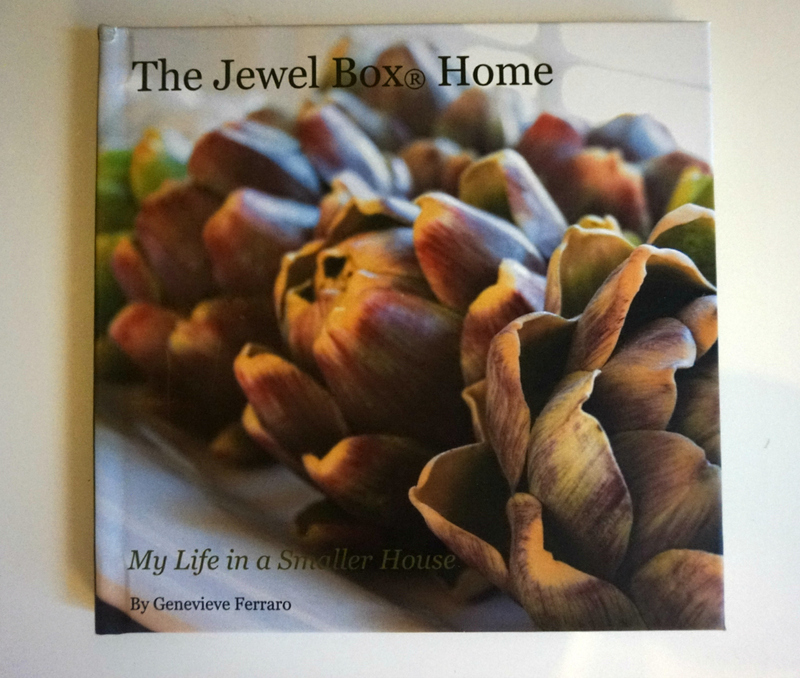 I was recently sent a lovely little book to review, called the Jewel Box Home by Genevieve Ferraro. There’s something a little bit special about this book, because it’s been self-published by the author at a site called Blurb. But more about the book itself. The book tells the journey of one woman, and her family as they learn how to live in a smaller home. Now, ideally suited to the US market, unfortunately the house really doesn’t seem that small by UK standards. But having said that, she does have some nice tips for making the most of your space. Understanding that children learn a lot from sharing a room/bathroom/space/toys etc, as they grow up is an interesting point, but, where it might be common place in the States for adults to have separate bathrooms from their children, it’s not really a necessity in the UK. It reads as though the author has ‘big house envy’ and has lived a lifetime trying to deal with this. Her children, now young adults at college, have no such issue and never have. Quite refreshing. It’s an interesting read, and one which I may not have come across if it weren’t for sites like Blurb, where authors can publish their own books. Self-publishing has significantly increased in 2014, with authors realising the huge benefits to them. No more haggling with agents or loss of creative control. Own all the rights, and a large percentage of the profits too. Self-publishing your book has never been more attractive. Blurb has several different publishing features that can help you get the most out of the self-publishing experience. Tools such as Bookwright, which contains design templates and flexible layouts mean you don’t have to hire a professional designer. Global distribution is also available with the Blurb to Amazon program, where books self-publishers can sell their photo paper books on Amazon.com. Have you ever dreamed of publishing your own novel? Do you have a book inside you, waiting to get out onto paper? Or perhaps your gran left her own recipe book, handed down the generations to you. Wouldn’t it be amazing to get it published into a book you can pass onto your children? As a parent, I’m keen on the idea of collating my children’s story’s through the years and turning them into a special book, to present to them on a special birthday. Or how about creating a beautiful photo book of your child’s year or special events, or even a holiday. A great way to capture memories in a great format. You can access the Blurb website here. Do hop over and take a look around at the interesting and diverse selection of books.